Retro yet ageless. Karma is a powerful, spicy and unique patchouli and citrus perfume. It's a strange slow-burner for some; you fall for it without realising what's happening. Others love it from the first sniff as they are transported to the age of freedom. Main notes : Orange, patchouli, pine, lavendin, lemongrass, elemi, cassie. Melt your solid perfume directly onto your wrists and neck for an immediate dose of your favorite aroma. You can also rub some behind your ears and on the back of your knees. The perfume I am reviewing here is the solid version of Karma. The solid version costs £5.00 while the small spritzers are £10.0, the large 30ml version is £21 and the 2ml sample sells for £2.00. This scent is one of the cheaper ones that Lush create and that is why I bought this one first of all my Lush perfumes. I think the solid version offers good value as the 2ml wouldn’t give me many uses and the solid one has given me plenty of use over the last months although mine is very close to the end now. You don’t need a lot to get a pretty decent aroma but you do have to be careful if it is very hot weather as it does melt very easily. I would also suggest that keeping it in the fridge may affect the scent so would not advise that. 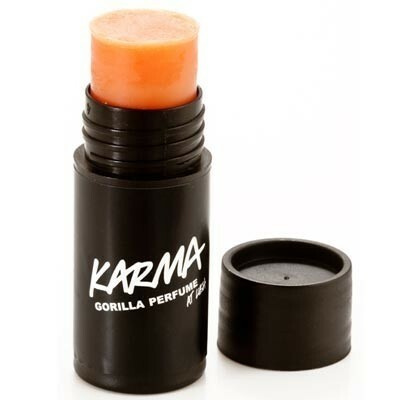 Karma is one of the oldest scents from Lush and it existed when they we ‘Cosmetic to Go’ I remember buying it some fifteen or more years ago. 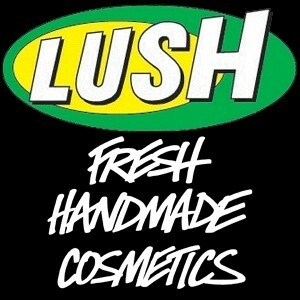 I love hearing the inspiration behind the creation of the different Lush scents. They are all so different and rather like poetry but of smell rather than words. This one is no different. I really admire Mark Constantine and his philosophy and the fact that he does things he really believes in. His story about how this perfume came to be is another great, rather poetic sort of story. It really is another perfect summer fragrance as it is a refreshing with its orange blossom notes but then hits you with its more heady patchouli and pine taking you back in time to the late sixties and early seventies in my case. It is orange but it has got a very strong heady note which my husband hates as he says it smells like sick!! It doesn’t and his smell buds are really weird but I do know what he means , it is the same sort of slightly sickly smell that i find ylang ylang is for me. What does this smell like? It smells creamy, heady and a sort of heady deep orange fragrance. It is the deeper version of ‘Orange Blossom’ this has more depth and very heady heart notes, sweet, slightly citrus but as though it is Orange Blossom on a holiday in India as it has picked up all the incense smells from there. I find it is lovely at any time , it works for both night and day and lasts for ages without fading. As lush describe it on their website it is like “running through a field of flowers on your way to Woodstock” Which sums it up perfectly. The retro elements of the perfume take me back and it is a combination of shopping in ‘Biba’ and a trip to India. Although it is very strongly orange there is a strong warm heart and depth which comes from the patchouli and pine. Patchouli is one of my all time favourite essential oils so I am bound to love it in whatever . WHAT HAVE THEY HIDDEN IN THIS ONE? This is not as complex as some of the Lush perfumes and although this has layers of notes which hit you as the perfume develops there are fewer of them. This perfume has these main notes: Orange, patchouli, pine, lavendin, lemongrass, elemi, cassie. Orange is obvious and that is what hits you initially then the creaminess comes through and the scents combine and I really struggle to separate the notes in this as they seem to be all there together. The orange stays but it isn’t just orange it is sweeter and has more depth than just orange, it may be the lemongrass that lifts it a bit. This was a scent I remembered from years back so that is why it was the first solid perfume I bought when our Derby store got their full range of perfumes in. I always try each perfume out a few times in Lush before I buy it. I put one smell on each wrist and allow it to settle. It is actually quite hard to smell different perfumes in the Lush shop as there are so many smells going on in there. What I usually do is put the perfume on using the samples there. I then go off and do my shopping. I do one or sometimes two perfumes at a time. If I like it still after I have finished my shopping it then does on my ‘Wish List’. I have to admit I do buy a lot on Ebay as you can often get them cheaper there. I just look for which are on there and bid to a certain amount. I miss out on loads but I decide what I am prepared to pay and stick to it. I also ask for them for gifts from the family too and that is how I have built up my collection. I have the solid perfume in this and I am happy with how it works on me. Sometimes the solid ones smell different from the 30ml full concentrate. I haven’t tried the concentrate in this so I don’t know how that works in comparison. I think maybe I would not like the concentrate as it might be a bit too much. I love the way the solid perfume lasts behind my ears and down my cleavage as I can smell the aroma rising as my body heat helps it dissipate. This is a lovely retro sort of perfume and I do like it but I have to choose when to wear it. I know a lot of people are not keen on the scent so I avoid wearing in when with them. I think this is one that you either love or hate as it is very distinctive. The nice thing about a solid perfume is that you can put it exactly where you want it. It is also very handy for the handbag as it NEVER leaks unless the weather turns very hot. It isn’t a good idea for example to leave it in a car as the sun will cause it to melt. I had to be very careful when we were on holiday recently in the USA and I kept my solid perfumes in our cold bag with all our cold stuff when we were travelling from place to place. I also left them in the hotel rather than in my handbag as it was over 35°C most days and that was enough to make them very soft when in my bag. The solid perfumes usually have a use buy date about a year after they were made. I have not had any that I have had last longer than a year so I am not sure how the scent lasts should you have one over the use by date. I like mine too much to have them last that long as I use mine daily. Another good thing about these little solid perfume tubes is that when you finish them these little tubes or pots count as one container to recycle so if you take five back to Lush you can choose a FREE fresh face mask or fresh hair mask so even the container is worth something. If you are lucky enough to have a Lush store like the one in Derby with a full range of perfumes I recommend you to give them a try. They are not to everyone’s taste as they are quite strong and a lot of them have quite deep strong and more heavy notes but I love them and spend ages listening to the stories as to the inspiration behind their creation. To me perfumes are a sort of experience that is more than just the smell. They are a bit like fine wines and single malt whiskeys in that there is poetry and art in their creation. These to me are all part of the perfume, the inspiration, the poetry and the images that are created by you in your head as you first sniff the perfume as well as the effect you have on the scent, the way it changes on you and your own skin. It is all part of the magic to me. Not the prettiest packaging and it does melt in hot weather!! 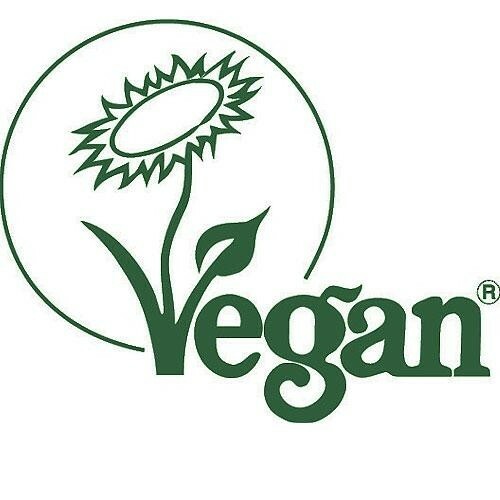 I love lush and their perfume sticks smell amazing but i do find them a little strong and overpowering,although the scent does change on your skin. A gorgeous smelling perfume but i find it too overpowering im afraid. Lush's signature Karma fragrance isn't to everyone taste, but I absolutely adore it! A wonderfully warm, orange scent. Inexpensive. Long lasting. A handy size to keep in your handbag. One of Lush's Gorilla range perfumes. Affordable with a memorably spicy fragrance. "We are very lucky in Derby because our lovely Lush shop in the Westfield centre has the entire range of Lush perfumes as well as..."